Round shaped foil balloon measuring approximately 18 inches. Bright multi-coloured balloons all over with streamers and dots. Says happy birthday in blue in the centre. Suitable for helium or air fill. A round shaped balloon measuring approximately 18 inches. 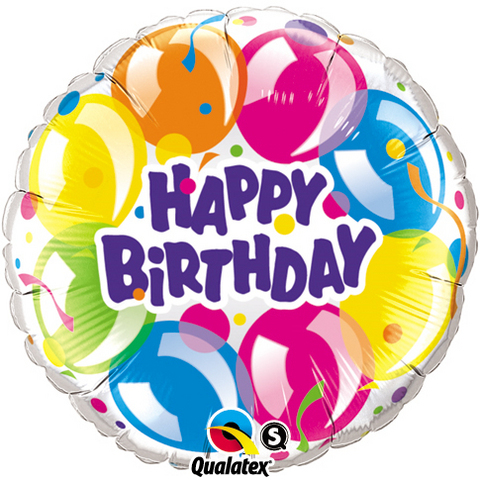 A clear see through balloon with a fun brightly cupcake and circles design in bright colours with touches of metallic silver, A helium fill balloon that can also be air filled and suspended. Round shaped foil balloon measuring approximately 18inches. A round yellow and purple foil balloon illustrated with smiley faces wearing party hats, stars, streamers and the message 'Happy Birthday' all in bright colours. This balloon will make a great gift or decoration for the party venue. A round foil balloon measuring approximately 18 inches. A brightly coloured design balloon illustrated with a large ice cream sundae complete with chocolate sauce, sprinkles and the wording Happy Birthday. A helium fill balloon that can also be air filled and suspended. Heart shaped foil balloon measuring approximately 18 inches. Light pink background with the message 'I love you' in the centre with botanical surroundings and patterns in a variety of colours. Can be air filled and suspended of helium filled.